First it was Thatsmapizza stealing the Drop. Then Gugsy stole my MAL Challenge. Now to continue on the cycle of stealing, I have stolen the Ani-TAY café from an idle Protonstorm! Anyway, a lot of people have been asking me regarding the Ani-TAY favourite anime poll I’m currently working on (Coming Soon™) and while most of you are just curious and want to see the results some people are being... especially annoying. So for today’s topic: Who is the most annoying anime character in a series you have watched? 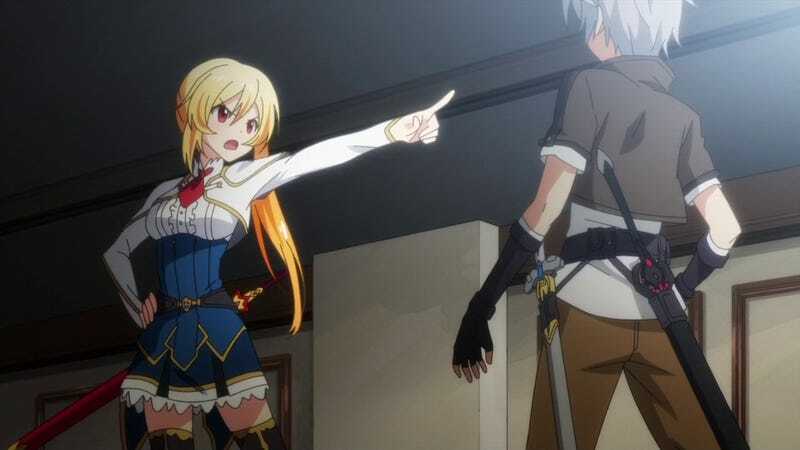 Right off the bat I am nominating the entire cast of Undefeated Bahamut Chronicle. The main character is a copy paste of Bell Cranel from DanMachi with even less personality, surrounded by a school of women who have been ripped off from various magical high-school anime. You have Lisesharte, who starts off as a Textbook Tsundere but completely drops the Tsun by half way through episode 1, and Philiphie, the pink haired, ditzy, childhood friend with 90% of her character existing for fanservice. There’s Celistia, the best fighter in the school and the sworn enemy of the Y chromosome, who has a secret. And finally, the main protagonist’s little sister who only appears in an episode to spout exposition over fight scenes. Header from Undefeated Bahamut Chronicle.